Mocha just turned 17 this week. He loves carrots (and me) and peppermint treats (and me) and Brittany (and me!). I guess I kind-a love him too! He does put up with Santa hats, walking across tarps and other such “training”…I think he realizes I’m getting pretty good at some of that stuff! Born April 3, 1995. Mocha is a paint and really is the color of coffee. He has a white blaze, his hind “shoes and socks” are white and he has a white “blotch” on his ride side. I call it his “dollop of cream”! 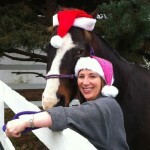 He puts up with – well, Santa hats – and lots of other craziness. It would be hard to do without him! I can't believe she makes me do this!